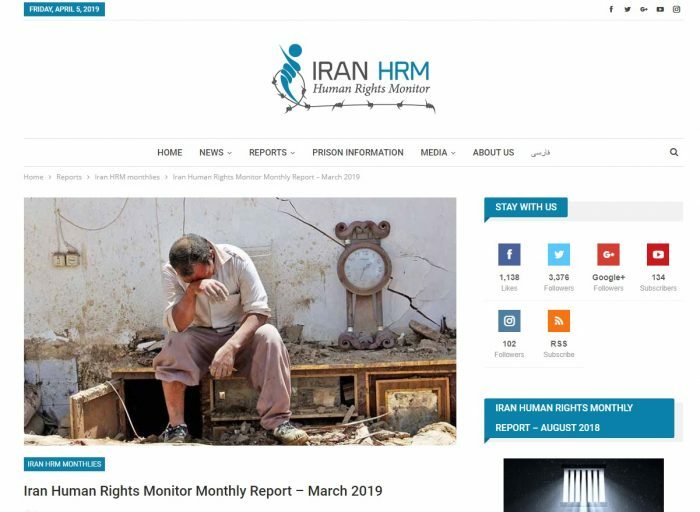 The cover photo for “Iran Human Rights Monitor” report – March edition, covering the horrific flooding and the consequences of the mismanagement of the regime on the people residing in the flood-stricken areas. 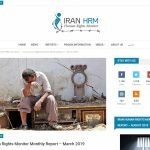 Iran Human Rights Monitor released its monthly report for the month of March. 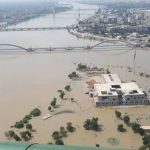 The group shone a light on the recent flooding that has affected 28 of Iran’s 31 provinces, reporting that at least 200 Iranian have lost their lives in the disaster. The group accused the regime’s aid of being “too little and too slow.” Instead of getting aid workers to the regions affected as quickly as possible, the regime dispatched its Revolutionary Guards (IRGC) and Basij forces. They were instructed to prevent any outbreak of protests. As Iranians were stranded without food and water, the regime refused to help, instead focusing on its own preservation. “Many social media users observed that residents, often themselves victims of the floods, rushed to help others, while the authorities did very little or nothing,” Iran Human Rights Monitor reported. Inspired by messages of solidarity from President-elect of the Iranian opposition, Maryam Rajavi, Iran’s citizens rallied around each other and offered their support for their fellow compatriots. Shop owners, mechanics and other business owners in Shiraz offered their services to the flood victims free of charge. 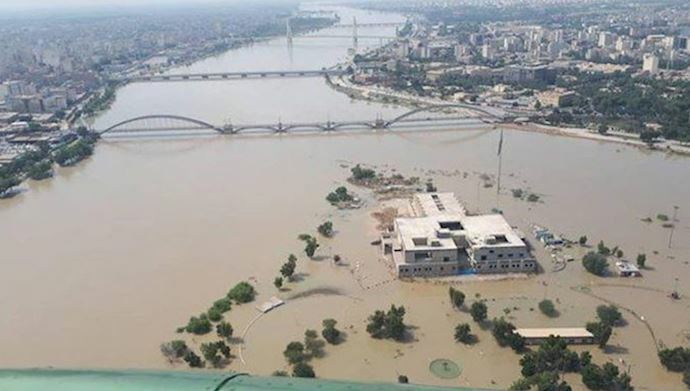 Iran Human Rights Monitor noted that the regime must bear a share of the responsibility for the scale of the flooding. “Authorities have been over-constructing for a long time and it has destroyed the natural flood barriers that were in place,” it reported. The regime has destroyed more than 30% of the country’s forests, built villas in agricultural lands, failed to effectively upkeep dams and built on vulnerable river banks and flood plains. This natural mismanagement of Iran’s natural flood defenses exacerbated the disaster and undoubtedly led to the destruction and loss of life this month. The group also reports that the regime carried out 15 public executions over the course of the month, including a father and son in Birjand Prison charged with the murder of two regime agents. Three activists received flogging sentences. 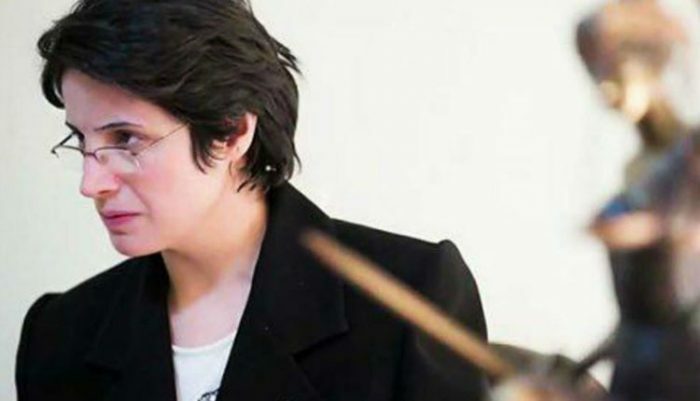 Nasrin Sotoudeh, a prominent human rights lawyer arrested in 2018, was tried again on a further seven charges. The lawyer is currently in prison serving a five-year sentence for “association and collusion with the intent of sabotaging national security”. She was tried in absentia for a further seven charges. Her lawyer was prevented from attending the trial. She received another 34-year prison sentence and 148 lashes. Sotoudeh became the target of the regime’s injustices for her peaceful human rights work. She was vocal in her defense of women protesting the regime’s compulsory veil laws and a public critic of the death penalty. There were also reports of prisoners being denied treatment. Ali Badrkhani, who is being held at Urmia Central Prison, is reportedly being denied access to outside treatment for his kidney disease. Abolghasam Fouladvand at Raja’I Shahr Prison is also reportedly being denied treatment for his heart failure. Iran Human Rights Monitor also reported the rampant arrest of ethnic minority groups in Iran. In March, the Iranian Judiciary sentenced 23 members of the Sufi Dervish to a total of 190 years in prison and numerous lashes. Most of those convicted received sentences of between six and nine years and will serve them in the Greater Tehran Prison. At least eight Iranian- Arabs from Ahvaz and 24 Kurds were also arrested throughout the month. 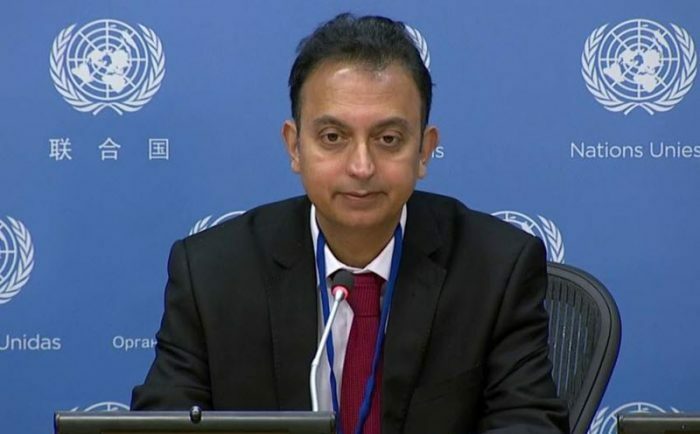 On Monday, March 11th, United Nations Special Rapporteur on the situation of human rights in Iran Javaid Rehman presented his first report to the U.N. Human Rights Council. In his report to the council, Rehman expressed concern about the increasing number of executions in Iran and the regime’s practice of sentencing minors to the death penalty. Hamaneh’s words are reflective of the regime’s attitude toward the MEK, which it sees as an existential threat and often attempts to delegitimize when it feels threatened. 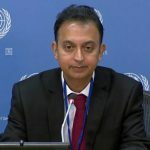 Despite Hamaneh’s assertions, Rehman’s report is consistent with the U.N. ’s previous research, which has found Iran to be the world’s leader in executions per capita for years. The Iranian regime has refused a number of requests by Rehman to visit the country to independently assess the situation. Rehman was particularly concerned about the fact that the Iranian regime regularly sentences children to death. Under Iranian law, the death penalty may be imposed on girls as young as nine and boys as young as 15. This is a clear violation of both international law and U.N. conventions. As a member of the United Nations, this practice is a violation. “The practice, illustrated in numerous cases reviewed, of waiting until the child offender reaches the age of 18 before execution, repeated postponements, and the inherent vulnerability of the child given his or her age, amounts to a pattern of torture and other ill-treatment,” said Rehman. He further stated that at least six people convicted of crimes that occurred when they were under the age of 18 were executed in 2018. Another 85 child offenders currently await execution. Rehman called on the Iranian regime to comply with international law by abolishing the death penalty for juvenile offenders. He also asked that all current death sentences against children be commuted. Rehman also expressed concern about the regime’s treatment of protesters who have taken to the streets in increasing numbers since the nationwide popular uprisings in December 2017. He noted that the country is in the midst of an economic crisis, which has led to massive protests over unpaid or delayed wages, water and food shortages, lack of healthcare, high unemployment, and substandard living conditions. The Iranian regime has responded to protests by arresting the participants in large numbers. Rehman called for their release. Women’s rights lawyer, Nasrin Sotoudeh sentenced to 38 years of prison and 148 lashes, for defending the rights of women. 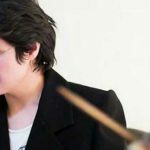 The Iranian human rights lawyer, Nasrin Sotoudeh, received a 38-year prison sentence with 148 lashes in a ruling the Iranian opposition has condemned as “anti-human” and “misogynist”. Mrs. Sotoudeh has devoted her life to standing up for Iranian women. She was a vocal critic of the clerical regime’s forced hijab (veiling) laws and frequently spoke out against the regime’s use of the death penalty. These compassionate and sensible objections to the mullahs’ tyranny earnt her the attention of the regime. She was arrested after representing women who were arrested during the nationwide protests in 2018. She was tried in absentia in December 2018 and sentenced to five years imprisonment in one case and 33 in another, bringing her total sentence to 38 years in prison, her husband reported on Monday. The sentence has been condemned by the Iranian opposition and prominent international human rights groups. 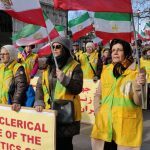 In a statement, the Women’s Committee of the National Council of Resistance of Iran (NCRI), the umbrella organization or the largest Iranian opposition group, the People’s Mujahedin Organisation of Iran (MEK), condemned the ruling. Luther said that the ruling and Nasrin Sotoudeh’s sentence “consolidate Iran’s reputation as a cruel oppressor of women’s rights.” “Jailing a human rights defender for her peaceful activities is abhorrent but the fact that the judge in Nasrin Sotoudeh’s case used his discretion to ensure that she stays locked up for more than is required under Iranian law compounds the outrageous injustice of her sentence,” he said. Both the MEK and Amnesty International have called on international human rights defenders to apply pressure to the Iranian regime in an attempt to secure Nasrin’s freedom. Luther singled out the European Union as one institution that should use its leverage to secure her freedom. This is among the longest and most excessive sentences the regime has handed down against a human rights activist in recent memory. The move has been interpreted as a sign that emboldened by the international community’s inactivity in the face of blatant human rights abuses, it is intensifying its crackdown on political dissent across the country. On Tuesday, March 12, reports emerged from MEK sources inside Iran of another series of protests breaking out across the country. Unpaid salaries have mobilized large swathes of the Iranian population. This time, it was clients of the Caspian credit firm, a company closely affiliated with the regime’s Islamic Revolutionary Guards Corps (IRGC), that were demanding their money. Since the beginning of 2019, railway workers, teachers, bus drivers, and taxi drivers have all taken to the streets over unpaid salaries and poor working conditions. Years of economic mismanagement, corruption, and embezzlement have left Iranian institutions hollow. Regime officials have plundered workers’ savings, leaving many Iranians struggling to survive in the midst of an economic crisis. On Tuesday, the clients of Caspian gathered outside the offices of the Judiciary in Tehran to demand reimbursement for their stolen savings. They were the victims of what amounted to a government-run Ponzi scheme. On the same day that Caspian investors demanded their money in Tehran, in Southern Iran workers at the South Pars gas field projects were holding a strike of their own. The workers had begun their strike the preceding morning following two months of unpaid wages. There were pensioners among the workers that complained their pension had not been paid out for two years. 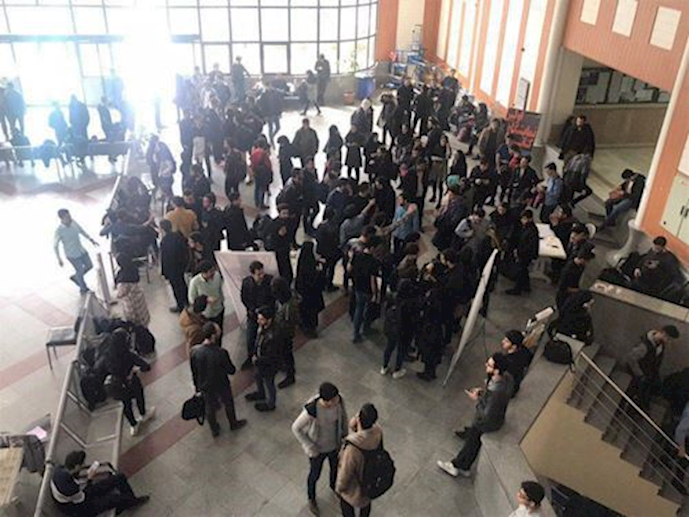 Elsewhere, in Tehran, students attending the Khaje Nasiredeen University protesting the ruling regime and campus officials’ neglect of their human rights. They released a statement that read, “we the students of Khaje Nasiredeen University announce today that enough is enough and [the] neglect must come to an end. 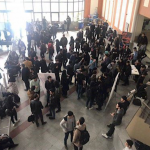 The students’ basic rights must be respected and we demand all our rights be acknowledged.” Similar protests have taken place at Razi University in Kermanshah and the Science University in Mazandaran, sources from MEK report. The students and investors are part of a wider resistance movement building in Iran. Everywhere across the country, workers, students, pensioners, ethnic minorities, and human rights activists are calling for regime change. Iranians have had enough of the persistent mismanagement of Iranian finances. They are tired of the mullahs using the savings of hardworking Iranians to fund foreign wars and terror groups. They are tired of being kept in abstract poverty while the mullahs enjoy a lifestyle of opulence. They are tired of seeing their funds funneled to Hezbollah in Lebanon, Assad’s regime in Syria and the Houthis in Yemen, etc. Iranian voices will not be silenced anymore. They are making their voices heard. 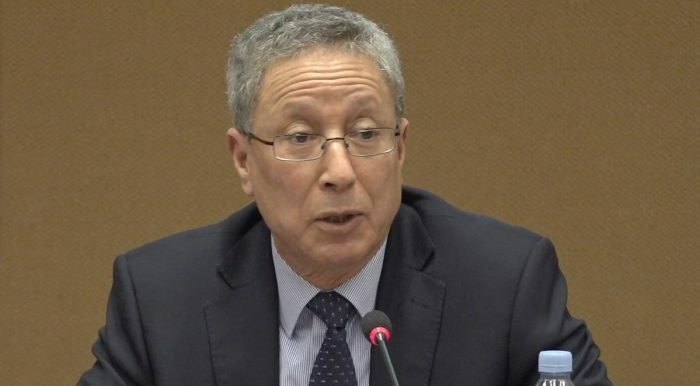 Tahar Boumedra, the former chief of the human rights office of the United Nations Assistance Mission for Iraq (UNAMI), penned an op-ed for the prominent news and analysis site, Eurasian Review. The legal expert and human rights champion criticized the Iranian regime over its recent appointment of Ebrahim Raisi as head of the judiciary. 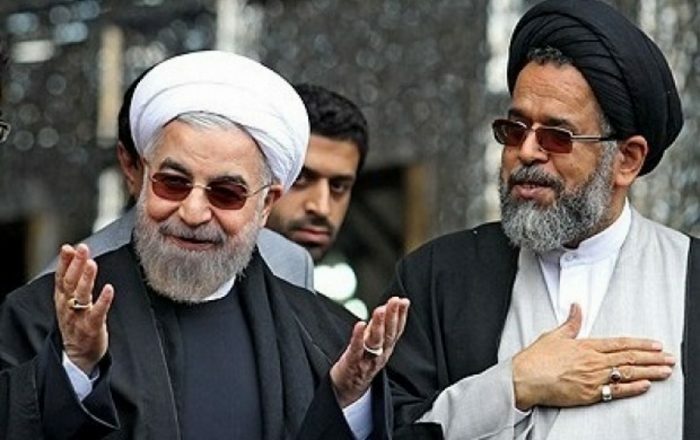 Top clergies in charge of the criminal Iranian regime’s Judiciary. 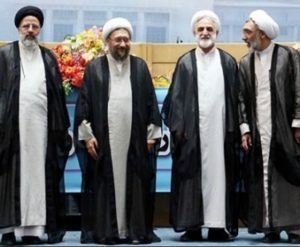 From left to right, Ebrahim Reisi, recently promoted as the chief of regime’s Judiciary, member of the 1988 Massacre’s Death Committee, Sadegh Larijani, previous chief of the regime’s Judiciary, Mohsen Ejehei, the deputy of regime’s Judiciary, Pour Mohammadi, regime’s previous Minister of “Justice”, also one of the 4 members of the Death Committee during the 1988 Massacre of 30,000 political prisoners in Iran. 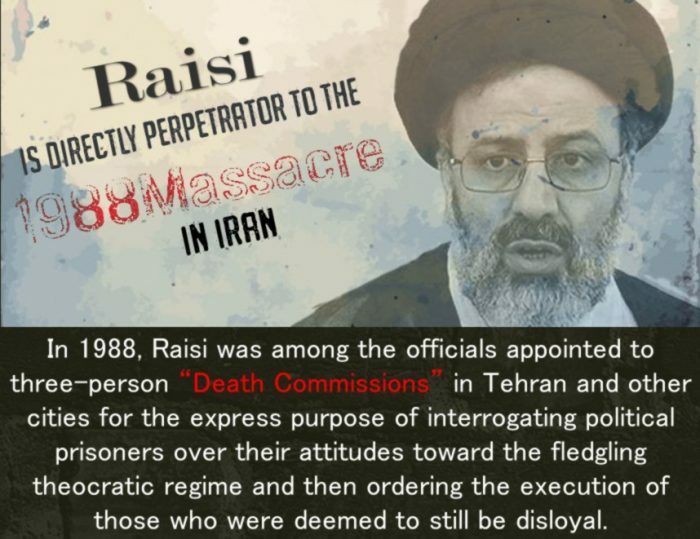 In his role in the death commission, Raisi rounded up and killed members of the People’s Mujahedin Organisation of Iran (MEK) and other Iranian pro-democracy groups. Boumedra writes, “the precise scope of the killings remains unclear because many of the victims were buried in secret mass graves,” many of which were subsequently paved over in an attempt to hide the regime’s atrocities. The deliberate destruction of evidence in this manner prompted Amnesty International to call for a full UN-led investigation into the massacre. 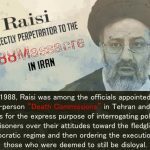 Given the regime’s willingness to promote those involved in the massacre, such as Raisi, to senior positions within the regime, it cannot be trusted to carry out a full and impartial investigation into the matter. Prior to 2016, when audio recordings were discovered outlining the regime’s involvement in the killings, the regime refused to acknowledge the massacre took place at all. Since the recordings, made by Hossein Ali Montarezi, were made available to the public, the regime has instead focused its efforts on justifying the massacre. “When asked in 2016 about the killings of PMOI (MEK) members and other critics of the Iranian regime, Pourmohammadi (the former Justice Minister) openly stated that he was “proud” to have helped to carry out “God’s command” of death,” Bumedra pointed out. 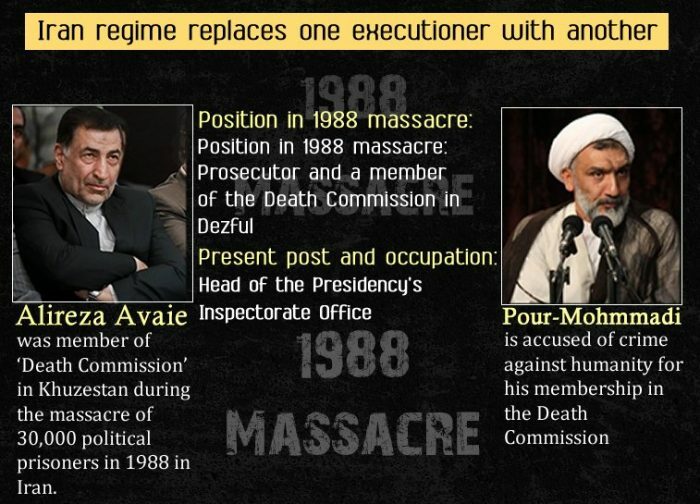 Pourmohammadi was then replaced in 2017 by another former death commission member, Alireza Avaie. “These and other high-profile appointments have sent the clear message that the regime stands by its past acts of violent oppression and has no interest in rehabilitating its image,” Boumedra wrote. Raisi’s appointment only serves to further demonstrate this message. Raisi’s appointment will have a significant impact on the Iranian opposition movement and the MEK. It sends the message that Tehran is intending to crack down even harder on Iranian protestors and civil disobedience. As the Iranian opposition gears up for another year of protests in 2019, the Iranian opposition will no doubt hear this message. However, they are unlikely to be deterred. Since 2017, the Iranian protest movement has expanded. It has untied Iranians from all walks of life and pensioners, teachers, students, factory workers, investors, farmers, and truck drivers have all marched against the violent and repressive clerical regime shoulder to shoulder. For the MEK, who have played a leading role in the protest movement, Raisi’s appointment indicates that the regime is setting the scene for another massacre. 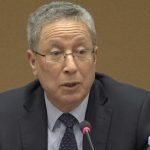 Boumedra points out that only the international community can stop another massacre on the same scale as 1988. They must apply economic pressure to the mullahs and secure human rights reform. Without it, the lives of millions of Iranians hang in the balance. On March 9th, hundreds of supporters of the Mujahedin-e Khalq (MEK), members of the Anglo-Iranian Communities took part in a rally outside of 10 Downing Street in London in honor of International Women’s Day. The demonstrators focused on the pivotal role of women in the ongoing anti-regime protests in Iran and called for the British government to recognize the right of the Iranian people to overthrow the theocratic regime. Speakers at the demonstration condemned the deplorable treatment of women and girls under the religious dictatorship in Iran, saying that the regime’s policies have relegated women to the status of second-class citizens. They emphasized the NCRI and the MEK, under the leadership of Mrs. Maryam Rajavi, offer a democratic alternative to the mullahs’ regime that promotes gender equality and equal representation in government. They pointed out that women in the NCRI and MEK are leading the Iranian Resistance in the fight to overthrow the theocratic regime. In a December 2018 report, the NCRI Women’s Committee wrote that almost one thousand women were arrested in 2018 for participating in anti-regime protests. Many of these women were arrested for protesting against mandatory hijab. More recently, Supreme Leader Ali Khamenei appointed notorious Death Committee member Ebrahim Raisi as head of the regime’s Judiciary. 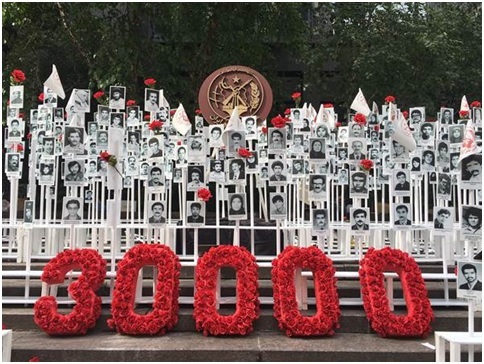 Raisi sent thousands of MEK members to the gallows during the 1988 Massacre, during which 30,000 political prisoners were executed during a single summer. Victims of this crime against humanity included pregnant women and girls as young as 15 years old. “I join you in condemning the appointment of Raisi and urging the UK Government to take the lead and to work with allies at the UN to ask relevant UN bodies to order an investigation and bring the regime’s officials like Raisi to justice for crimes against humanity,” said Malcolm Fowler, Senior Solicitor and former member of the Human Rights Committee of the Law Society of England and Wales, in reference to Raisi’s appointment. Speakers also called on the UK to designate the Islamic Revolutionary Guard Corps (IRGC) and the Ministry of Intelligence and Security (MOIS) as terrorist organizations, citing their repression of the Iranian people and their involvement in terrorist plots against Iranian dissidents and MEK members in Europe, the UK, and the United States. 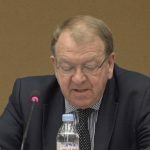 Dr. Jocelynne Scutt, former judge, jurist and professor at Buckingham University, spoke in solidarity with the women of Iran who face oppression at the hands of the Revolutionary Guards: “We stand here today on International Women’s Day to honour Iran’s strong, committed, courageous women. To the brave women of Iran, who have to endure Revolutionary Guards’ harassment, we support you and stand beside you in the struggle for human rights, equality and justice. We salute you, we are with you,” she said. Iranians are making their voices heard at an unprecedented level. In recent months, hundreds of thousands of Iranian citizens have taken to the streets to demonstrate the regime’s brutality and violence. “Men, women, students, teachers, truck drivers, sugar-cane workers, business owners, and pensioners,” have come together under the call for regime change and in opposition to the regime’s greed, repression, and warmongering. The mullahs’ mismanagement of Iran’s finances has left vast swathes of the population living below the poverty line and struggling to put food on the table. 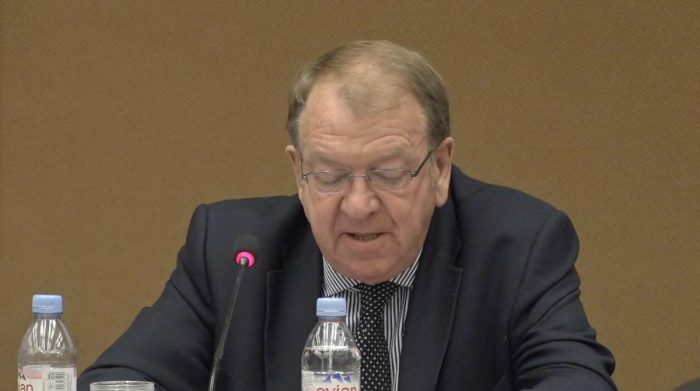 “Instead of trying to mend Iran’s broken economy, the mullahs have used their equivalent of the Gestapo, the Iranian Revolutionary Guards Corps (IRGC), to crack down on the demonstrators, murdering dozens and arresting over ten thousand,” Stevenson told those gathered in Geneva. Despite the very real threat to their freedom and lives, Iran’s brave protestors have not been deterred, but continue to oppose regime oppression and violence wherever it occurs. The People’s Mujahedin Organisation of Iran (MEK), the largest pro-democracy opposition group, work tirelessly to organize protests and raise international awareness to the Iranian cause. Their effort is necessary. Stevenson said, “Iran is the most repressive country in the Middle East. It executes more people per capita than any other country in the world. 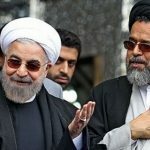 Here we have a regime that tortures, rapes, sodomizes, and executes political prisoners.” It uses flogging, amputations, and hanging as methods of punishment and has executed more than 4,000 people under the Rouhani administration. In 1988, the Iranian regime committed one of the worst human rights abuses of the twentieth century. In one summer, the regime executed more than 30,000 political prisoners, many of whom were members of the MEK. Although Amnesty International recently released a landmark report on the atrocity and have petitioned the UN to investigate, the crimes went largely unrecognized by the international community and no formal international investigation took place. “The perpetrators of that massacre are still in positions of power within the regime today,” Stevenson exclaimed. “Many have even boasted about their roles.” One of these has been Ebrahim Raisi, President Hassan Rouhani’s head of the Iranian judiciary. Many European heads of state have expressed a reluctance to follow the US’s lead in adopting strict economic sanctions against the regime. In what amounts to a gesture of placing profits ahead of human rights, France, Germany, and the UK are actively exploring ways to bypass US sanctions and continue trading with Iran.